Sanger helped popularize the term “birth control” because she felt that women had the right to control their own bodies and determine when, and if, they would have children. Sanger opened her first birth control clinic in Brownsville, Brooklyn, on October 16, 1916 — 101 years ago today. She and her sister, Ethel Byrne, had spent time researching reproductive health care access in the Netherlands, which inspired them to start their own clinic in the United States. They spent time talking to residents in Brooklyn to ensure that the community would be comfortable having a birth control clinic in their neighborhood. Despite community support, the Brooklyn police raided the Brownsville Clinic on October 26, 1916, just 10 days after it opened. An undercover policewoman and the New York vice squad raided the clinic and arrested Sanger, Byrne, and their assistant Fania Mindell, who served as a Yiddish-language interpreter for the patients. 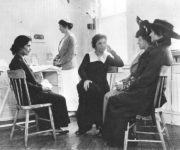 Sanger and her colleagues were released from jail the following morning, and she reopened her clinic a few weeks later, on November 14, 1916, but the clinic was raided again two days later. The police convinced the landlord that Sanger needed to be evicted, and the clinic was permanently closed. Sanger did not give up. Her trial began on January 29, 1917. She was offered a plea bargain, but Sanger refused to agree. She willingly spent 30 days in jail. After she was released, Sanger brought her case to the New York Court of Appeals. Although her conviction was sustained, the appeals judge ruled that doctors could prescribe birth control to married people to protect their health. Sanger joined forces with Katharine McCormick in the 1920s. McCormick was born into a wealthy family, and she married a very wealthy man. She was the second woman to graduate from the Massachusetts Institute of Technology. McCormick used her social position to help Sanger smuggle diaphragms into the United States to help women control their reproductive health. Both of them believed that science was a good way to help women maintain control over their bodies. Sanger moved to Tucson, Arizona, in the 1930s because of the warm climate. The move didn’t stop Sanger’s activism. She continued to fight for access to reproductive health care her entire life. She set up the first birth control clinic in Tucson, Clinica Para Las Madres, in 1935. The clinic was built in downtown Tucson and evolved into Tucson’s Planned Parenthood Margaret Sanger Center, which is now located on the east side of town. Sanger stayed in Tucson until she passed away in 1966. Want to learn more about Margaret Sanger? Check out these articles from previous blog posts, or this article from Tucson Weekly that recounts Sanger’s lifelong passion for women’s health. Want to do more than read? Contact our volunteer coordinator to get involved. Then contact your elected officials, whether it’s at the federal, state, or local level, to make sure that we keep Margaret Sanger’s legacy alive. This entry was posted in Birth Control, History and tagged abortion, birth control, Brooklyn, Brownsville, Clinica Para Las Madres, contraception, diaphragm, Ethel Byrne, Fania Mindell, history, Katharine McCormick, Margaret Sanger, People v. Sanger, Planned Parenthood, reproductive health care, Tucson by Serena Freewomyn. Bookmark the permalink.